This past weekend, as has become my pattern, I fell ill. All Saturday I felt exhausted. Then I slept for essentially the next two days. 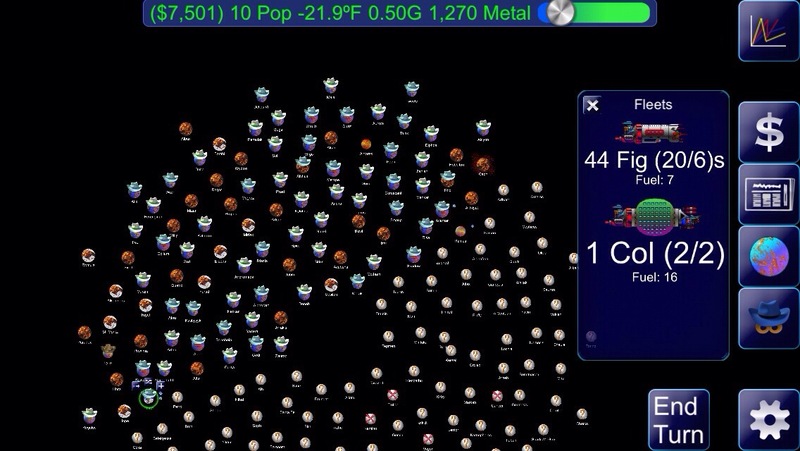 During this period of lethargy I somehow discovered that there’s an iPhone version of the classic game of inter-stellar conquest, Spaceward Ho! No time for writing! There’s a galaxy to conquer! With its simple interface and charming voice clips (“Yah!” for leaving a planet, “Whoooooooa!” for aborting a trip, and inarticulate grumbling from opponents when you thwart their plans), it became am obsession for me in the Apple SE days. I downloaded it immediately and played it whenever I was conscious. Only the sheer lunacy of “American Horror Story Asylum” got me to set it aside for a little while. If I start missing writing deadlines, I may need an intervention. This entry was posted in Life as a Zombie and tagged computer games by retrozombi. Bookmark the permalink.